Kirin Young is a graphic designer and artist based in Bangkok, Thailand. Working on jobs that are never the same, seeing and collecting new ideas and inspiring thoughts from working with a variety of personalities. The feeling when the job is done is the best feeling in the world, a sense of satisfaction and pride. Getting to be creative, it makes me happy to be able to make art. If you had a quote, proverb or a mantra printed on your shirt what would it say? 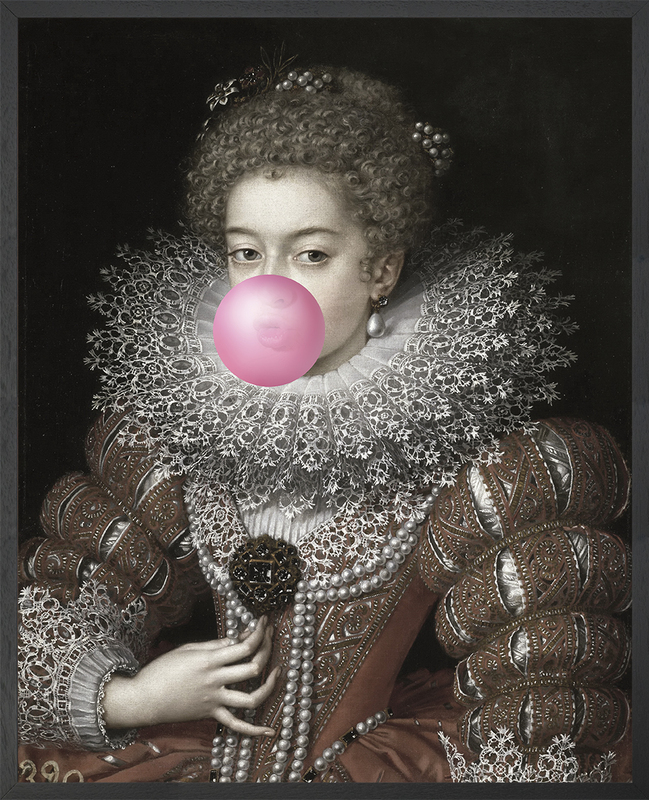 It’s a combination of classic art with a fun, modern twist that hopefully makes people smile. How long was the process from the idea to the finished work? A few weeks, there were experimental tweaks and changes made along the way to see what worked and didn’t work. How would you describe the look and feel of this work? decisions like the size, colours, and type of materials and mediums? 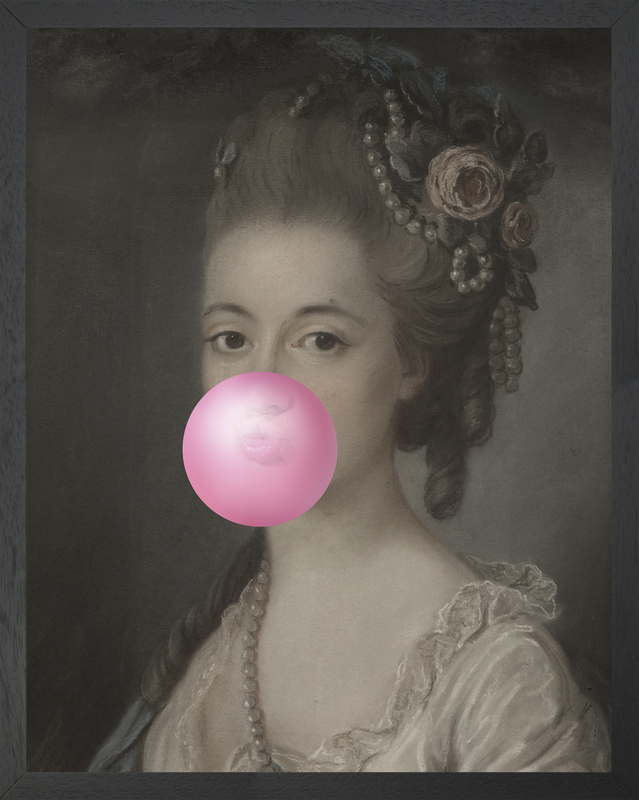 We chose the pink colour bubblegum as it contrasted nicely with the image. We also played with the saturation and colours in the original image to make the bubblegum “pop” even more. Apart from the design featured above, are you working on anything else exciting that you can talk about currently? Lots of new projects with mineheart. What were you interested in when you were a child and how did that lead you down the path to where you are now? My parents were always very supportive with anything arty or expressive. As a child I loved drawing, painting and as I got a little older I got interested in photography too. What design tools, equipment or softwares do you use? Photoshop, illustrator and photography equipment, and also some video editing software. What are your favourite places or things to do, to get inspired or destress? To get inspired, I love to travel, going to new places and seeing new things, old things and all sorts of different things, cultures, experiences and art. To destress I love sports, painting and I really enjoy photography. What is one of the most challenging aspects of your job? Working with different client criteria’s and briefs and being able to take criticism. Are there any particular tools, methods or approaches you use to help with this particular challenge and how does it help? Photography, considering all sorts of things, lighting, angles and shadows combined with some photo editing to create a believable and fun image. Often our greatest strength is also our greatest weakness, what is yours and how does does it affect your work? Focusing on details so it sometimes slows down the process. What do you believe or like to do that many people may think is crazy or unusual? Misusing energy, when working on some projects enjoying parts of them too much that I get swept up in paying attention to quite pointless details. Where can people find out more about what you, and how can they get in touch? Instagram and Facebook: Kirin Young.